I have been a member of the North Knoxville Business and Professional Association for over 10 years. It is a wonderful business and networking group in Knoxville, TN. I have been a board member for a number of years, but this year I am the communications chairperson. At a recent board meeting, we discussed ways to bring more value to our members. I offered to use some of my talents to promote our members in a unique new way at no charge. I am creating video interviews with our members and posting them here on my blog, on YouTube and on the NKBPA’s Facebook page and website. Members will also have access to the videos to use on their websites and other social media. I hope you will enjoy this new series. If you are a member of the North Knoxville Business and Professional Association and would like to schedule and interview please contact me at charminfoth@gmail.com. If you are not a member and would like to learn more visit http://www.northknoxvillebpa.org. If you have photos to highlight your business, please feel free to send me the jpeg files before we interview. If you have questions, don’t be afraid to ask. 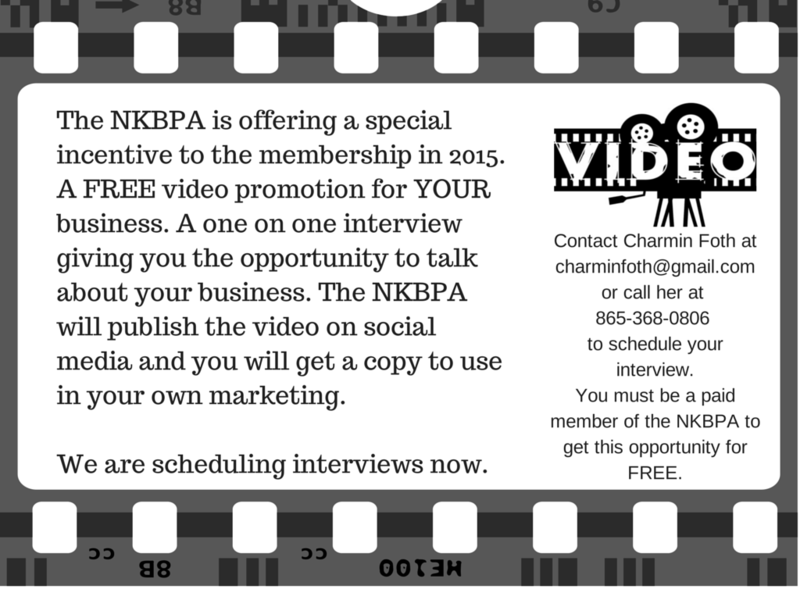 Are you a member of the NKBPA? Join now to take advantage of this great opportunity.